The Senior Flag Life performed their show “Waves” with music by Dean Lewis, and they also won first place. The varsity line performed their show “Broken Chains” to Amazing Grace. They took home a sixth place win and were awarded a “People’s Choice” award. The Eaton Winterguard program brought home two first place wins and an overall “Fan Favorite Award” at their first competition of the season, held on Saturday, Feb. 10. The three Winterguard teams competed at the Mid Eastern Performance Association (MEPA) Regional. The first competition this year was with the Junior Flag Line, who performed their show “King of New York” from the hit musical Newsies. They won first place. EATON — The Eaton Winterguard program brought home two first place wins and an overall “Fan Favorite Award” at their first competition of the season, held on Saturday, Feb. 10. The three Winterguard teams competed at the Mid Eastern Performance Association (MEPA) Regional. “In 2017, we competed in a Senior Flag Line Division which is a basic division for beginners. The judges focus on simple technique and performance qualities. Once you have reached their expectations, you are promoted to the next level, which we did in just one year,” Coach Lisa White said. The first competition this year was with the Junior Flag Line, who performed their show “King of New York” from the hit musical Newsies. They won first place. The Senior Flag Life performed their show “Waves” with music by Dean Lewis and they also won first place. This is a huge accomplishment for the Winterguard, because they have only been established for two years, according to White. Colorguard itself originated in Dayton and now groups from all over the world travel to the Nutter Center every April to compete in the competitive sport. The Eaton program has grown from only 11 students to 35 in just two short years. In 2016, Eaton High School Junior Abby Liddy and Colorguard Director White decided to approach Marching Band Director Paul Bingle to ask permission to start a brand new colorguard program. According to White, Bingle said it was fine with him as long as someone was dedicated to the program and could see it through. He advised them to also get permission from Superintendent Barbara Curry, who was a little unsure at first, but trusted White to move forward with the idea she seemed so passionate about. Flyers were hung around the school and a tryout was held. Eleven high school students were chosen to make up the brand new colorguard program. After marching band season, White decided to continue the guard into the winter season. Once again, a tryout was held and they had 14 winterguard members competing for the first time in 2017 at the Mid Eastern Performance Association contest with their show entitled “Hope” for breast cancer awareness. The brand new winterguard took home two first place awards and were invited as an exhibition group for championships that year. When the season ended, the colorguard traveled to Walt Disney World to march at Magic Kingdom with the Eaton Marching Band. “What an incredible first year,” White said. 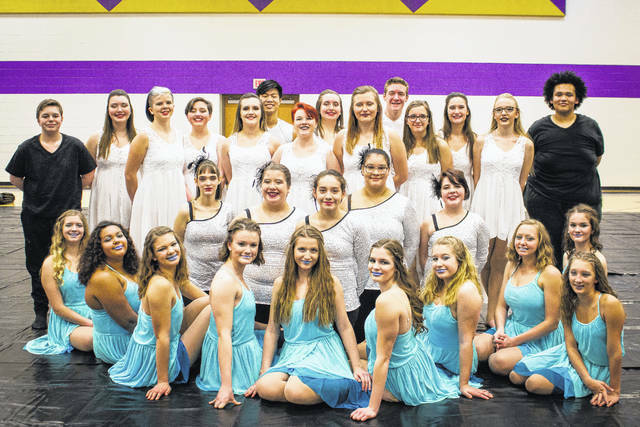 “Since then, the fall colorguard consisted of 23 colorguard members and have now grown to 32 winterguard members ranging from eighth to 12th grade. The program keeps growing. It has caught on like wild fire. “Colorguard and Winterguard are important because it gives students an opportunity to express themselves through movement, dance, and creativity with equipment. Many of these students have situations in their lives that are not ideal, and this program gives them an escape from that. It teaches them to be storytellers. White added, some people are skeptical about whether Winterguard and Cologuard should be considered a sport, but to her, the athleticism is inherent to the sport. The Winterguard program is open to all students grades eight through 12 and they welcome both guys and girls. According to White, it takes a “small army” to run the program. She said, “We are so thankful to the Eaton Band Boosters, Mr. Paul Bingle (Eaton Band Detector) and Abby Hinson (Assistant Director) for always supporting us. We have an incredible design team this year which consists of some guard moms, including: Jackie Othersen, Melissa Kuhn, Jessica West, Joquina White, Julie Rich, and Krista Wheeler. “I would like to add a special thanks to Dr. Curry, Scott Couch, Eaton High School Principal, Paul Bingle, Abby Hinson, and all of the Eaton Community School Staff for being such a big support system for us. Also, to the parents and family members who are present and help where they can. It gets challenging starting something new with a lot of questions, and mountains to climb but we are working through it and hope to someday have a program that begins with third graders all the way up. Prior to their first competition, the Winterguard held a community performance at Eaton Middle School. The gym was a packed house, as seats were full and the audience cheered their loudest for the students who have worked so hard for all they have accomplished. This performance functioned as practice for their competition, as the teams ran through their choreography three different times. Every move was met with applause from the audience as the students worked their hardest to show their parents and families all the effort they have put into the sport. The next performance will be at the Nutter Center on Saturday, Feb. 24. Pictures are not allowed to be taken at competition, if they are, the team will be disqualified. 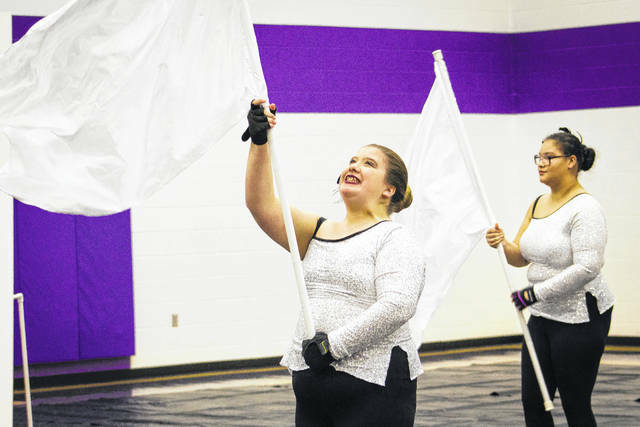 https://www.registerherald.com/wp-content/uploads/sites/41/2018/02/web1_WinterGuard2-7.jpgThe Senior Flag Life performed their show “Waves” with music by Dean Lewis, and they also won first place. https://www.registerherald.com/wp-content/uploads/sites/41/2018/02/web1_WinterGuard2-9.jpgThe varsity line performed their show “Broken Chains” to Amazing Grace. They took home a sixth place win and were awarded a “People’s Choice” award. https://www.registerherald.com/wp-content/uploads/sites/41/2018/02/web1_WinterGuard2-12.jpgThe Eaton Winterguard program brought home two first place wins and an overall “Fan Favorite Award” at their first competition of the season, held on Saturday, Feb. 10. The three Winterguard teams competed at the Mid Eastern Performance Association (MEPA) Regional. https://www.registerherald.com/wp-content/uploads/sites/41/2018/02/web1_WinterGuard-39-1.jpgThe first competition this year was with the Junior Flag Line, who performed their show “King of New York” from the hit musical Newsies. They won first place.